Come into your own with the Stella McCartney POP Eau de Parfum 50ml Gift Set, a fun-loving fragrance gift set for women. Stella McCartney POP is a free-spirited, lively fragrance destined to scent the adventure of a woman’s journey of self-discovery. Vibrant and carefree, POP is more than a fragrance, its inspiring composition an olfactory soundtrack to story of your life. 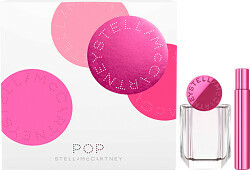 Fun, playful and anything but ordinary, Stella McCartney POP is the only scent that meets the mark. Stella McCartney POP Eau de Parfum Spray 50ml: This white floral fragrance opens with intriguing notes of tomato and violet leaf and green mandarin. The heart introduces floral nuances of violet, tuberose and frangipani, before notes of sandalwood, cedar and musk create an alluring base. Stella McCartney POP Roller Ball 7.4ml: Never let the POP fragrance disappear, top-up the enchanting scent wherever you are with this convenient and travel-friendly roller ball.